What’s the relationship between sleep and depression? Feeling sad is an integral part of the human experience, especially during difficult, stressful or challenging times. However, constant feelings of sadness, anxiety, hopelessness and apathy are all symptoms of depression. Depression affects the way a person feels, thinks, eats and sleeps. The relationship between depression and sleep is a complex one, and insomnia, oversleeping and troubled sleeping are all classic symptoms of clinical depression. Whilst not all depressed people have sleep disorders, many do. For some people, symptoms of depression occur before the onset of sleep problems. For others, sleep problems appear first. Depression may cause sleep problems and sleep problems may cause or contribute to depression. To understand the relationship between sleep and depression better, it is important to understand what happens to us when we sleep. What happens when we sleep. We spend on average, a massive 25 years asleep in our lifetime. Sleep is a crucial part of our regular routine, and getting enough good quality sleep, is as essential to survival as food and water. Without sleep it is more difficult to concentrate, to respond quickly, and to learn and create new memories. Research findings suggest that our brain and body stay particularly active whilst we are sleep, and that sleep maintains the body and brain by removing toxins in the brain that build up while we are awake. Stage 1 – this is non-REM sleep, and is the transition from wakefulness to sleep. During this short period of light sleep, our heartbeat, breathing, and eye movements slow, and muscles relax with occasional twitching. Our brain waves begin to slow down from its daytime wakefulness patterns. Stage 2 – this is non-REM sleep, and is a period of light sleep occurring with the onset of sleep, before we enter deeper sleep. Our heartbeat and breathing slow down, and muscles relax even further. Our body temperature drops and eye movements stop. Brain wave activity slows but is marked by brief bursts of electrical activity. We spend more of our repeated sleep cycles in stage two sleep, than in other sleep stages. Stage 3 – this is non-REM sleep, and is the period of sleep which is the deepest and most restorative. It occurs in longer periods during the first half of the night. During this stage, blood pressure drops, heartbeat and breathing slows to their lowest levels. Our muscles are relaxed and it may be difficult to be woken. Blood supply to muscles increases, tissue growth and repair occurs, and energy is restored. Hormones are released, such as, growth hormones which is essential for growth and development, including muscle development. Brain waves become even slower. Stage 4 – this is REM sleep which first occurs about 90 minutes after falling asleep. Our eyes move rapidly from side to side behind closed eyelids and brain wave activity becomes closer to that in wakefulness. Our breathing becomes faster and irregular, and our heart rate and blood pressure increase to near waking levels. Our arm and leg muscles become temporarily paralyzed, which prevents us from acting out our dreams. 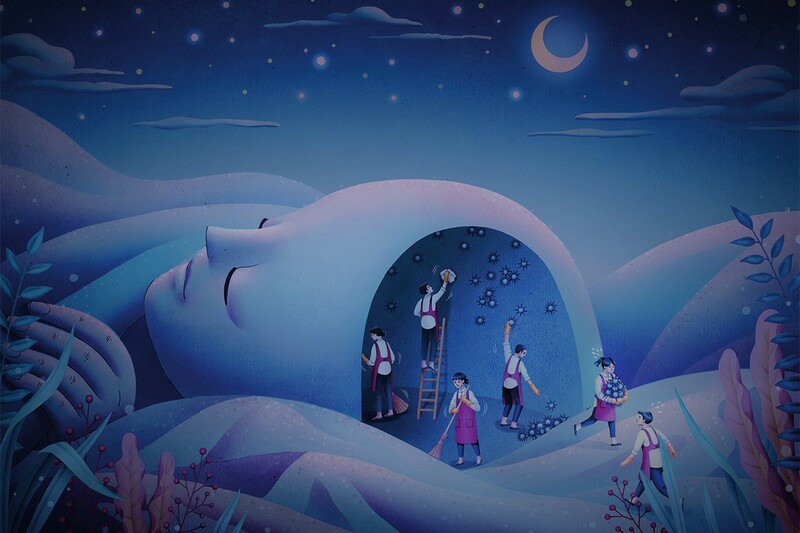 Most of our dreaming occurs during REM sleep, although some may also occur in non-REM sleep. Abnormal sleep interferes with mood and energy levels during the day, so it can be difficult to stay motivated, engage with others, exercise, and on some occasions even go to work. To cope, people who are depressed may self-isolate, which can lead to more sleep problems: loneliness itself is linked to fragmented sleep. The cause-and-effect runs both ways. Even if you are not depressed, lack of sleep increases your chances of depression and other mental illnesses. Depression makes achieving good quality sleep difficult, and it can lead to serious sleep issues and disorders. Research has shown that children with both insomnia and hypersomnia (oversleeping) are more likely to be depressed, to be depressed for longer periods of time, and to experience additional problems such as weight loss. Particularly for young adults, there is a strong correlation between insomnia and depression. In addition to this, teenagers who do not get enough sleep are more at risk of depression and suicide. Insomnia describes a difficulty falling or staying asleep. Unfortunately, people with insomnia are ten times more likely to develop depression than people without, and 83% of depressed individuals display symptoms of insomnia. Lying awake at night and ruminating on unpleasant thoughts feeds into the cycle of depression and excessive sleepiness the following day, is more likely to reduce general quality of life. Hypersomnia is the opposite of insomnia and is characterized by extreme oversleeping but still not feeling refreshed despite this. This can be explained by EEG (electroencephalogram) tests showing that depressed patients spend less time in NREM and shift to REM sleep earlier in the night. The more severe the depression, the earlier the shift to REM sleep is during the night. In more severe cases the sequence of sleep stages becomes disturbed and the first REM period occurs before the first deep sleep period. Given the importance of this first deep sleep period to growth hormones and the body’s maintenance, this pattern is particularly detrimental to the depressed person. Hypersomnia occurs in 40% of young adults with depression, and is more common in women. 4) Exhaustion – dreaming too much and having decreased deep sleep, will leave you feeling exhausted when you wake up. And then the worrying starts all over again. To stop going around in circles and getting more and more exhausted, finding ways to stop worrying is essential. An exhausted brain is more likely to use a depressive thinking style, and therefore, it is important to reduce the amount worrying. Reduced worrying will lighten the load on the stressed brain and can break the cycle of depression. To find some suggestions on how to improve your sleep naturally, you can click on my sleep guide for further information. You can also contact your GP or complimentary health advisor for some further ideas on how to improve your sleep. Previous Post Stress: it is sabotaging your life? What stress is, and how to manage it. Next Post Is Mindfulness Islamic? A very informative post. Insomnia and poor sleep quality have always both been an issue for me and I’m working hard at letting go of worries which will hopefully result in more of the deep sleep you mention! I’ll read your sleep guide next!